Republican candidate for Ohio governor Mike DeWine released additional details of his plan on Tuesday to improve the health of state employees while reducing costs. 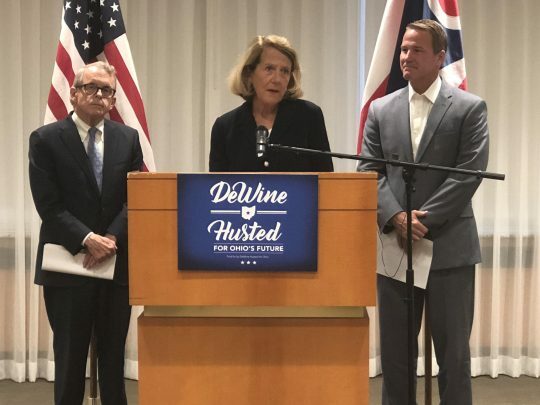 DeWine, the state's attorney general, spoke in Cleveland with his running mate, Ohio Secretary of State Jon Husted, and health care professionals about his proposed wellness initiative. The program is based off one from the Cleveland Clinic, which uses its "Rewards for Healthy Choices" program for 101,000 employees and family members. DeWine wants a program of the sort to now benefit state employees and adults in the Medicaid expansion program. The idea behind the program is to encourage healthy behaviors to reduce the prevalence of chronic diseases, which are often preventable but contribute to 80 percent of health care costs. Rewards for Healthy Choices sets goals for participants to reach healthy levels for blood pressure, Body Mass Index (BMI), Fasting Blood Sugar (FBS), and LDL (cholesterol). Additionally, the program promotes participants obtain a primary care doctor, quit smoking, and practice healthy stress management. Before Rewards for Healthy Choices, only 6 percent of those 101,000 Cleveland Clinic employees and family members met the six main goals of the program. Now, 43.6 percent do. Over $500 million has been saved since the plan started, with the Cleveland Clinic saving $254 million and employees saving $250 million in premium payments, according to the DeWine campaign. An changes to the state's Medicaid program would have to obtain approval in Washington, D.C., and the plan is not without its skeptics, cleveland.com reported. The company Health Employer Exchange helped design Rewards for Healthy Choices and replicate the proposed program for other companies. Its CEO, Stephanie McCutcheon, emphasized how the program has multiple benefits. "This is a private-sector driven, voluntary and proven system that we know can encourage people to get and stay healthier and give them the chance to live longer, more fulfilling lives," McCutcheon said. "This is a plan that can make the citizens of Ohio the healthiest in the nation while lowering the costs of healthcare." "We have to be bold if we are serious about getting people healthier and saving Ohioans’ hard-earned tax dollars to build a better, stronger health care system in this state," DeWine said. "We intend to lead in this area. Our goal is that this program could serve as an example for other levels of government and for others in the private sector, as well." Husted mentioned how the program was developed with ideas straight from Cleveland and not from Washington. "People often say solutions are not going to come from Washington," Husted said. "They’re right, in this case the solution comes from Cleveland. Mike DeWine and I will provide the leadership at the state level to drive better outcomes for improving the health and well-being of the people of Ohio and we’ll do it in a way that is affordable and respects taxpayers Ohio." DeWine and Husted are facing former Consumer Financial Protection Bureau (CFPB) director and Democratic candidate Richard Cordray and his running mate, former U.S. Rep. Betty Sutton (D., Ohio), in the November general election. This entry was posted in Politics and tagged 2018 Election, Governor, Health Care, Ohio. Bookmark the permalink.